If you listen to the national media, especially the conservative media, you might think that interest in environmental protection has gone the way of the dinosaur, swept away by a national consensus to focus on economic growth at all costs. Figure 1. Source: Gallup Inc.
Gallup Inc. is a global analytics and analysis organization that conducts what we all know as Gallup Polls. One of the questions they regularly include in their polls is “With which one of these statements do you most agree – protection of the environment should be given priority, even at the risk of curbing economic growth (or) economic growth should be given priority, even if the environment suffers to some extent?” The results are shown in Figure 1. It is a chart from Gallup showing the percent of respondents choosing the environment over the economy, and vice-versa. To it I have added a line showing republican and democratic presidencies (red and blue, respectively). Even 57% to 35% is a large majority – a difference of 32%: for every 10 people who chose the economy, 17 chose the environment. No American president has ever been elected by such a margin. Warren Harding comes closest (! ), with a margin of 26%. Some recent “landslides” involved margins of 23% (Nixon over McGovern, 1972, and Johnson over Goldwater, 1964). Even the famous Reagan “landslide” of 1984 (Reagan over Mondale) was only 18%. The current Tweeter-in-Chief, due to a quirk in the electoral college system, was elected with a minority of the vote (-3%). Figure 2. Source: Gallup, Inc. Since 1998, Gallup has also asked respondents “Is the seriousness of global warming generally exaggerated, generally correct, or is it generally underestimated?” Figure 2 shows the results. The dark green line shows the number of people who think the seriousness of global warming is exaggerated. The dark black line shows the number of people who think its seriousness is generally correctly portrayed. The gray line shows the percent of people who think it is underestimated. A minority of people think that the seriousness of global warming is correctly represented – that is constant across the whole time period. For much of the period, more people thought its seriousness was exaggerated than thought it was underestimated. In recent years, that has shifted, and now more people think it is underestimated (41%) than think it is exaggerated (33%). Where would I fit on that last question? I think I would refuse to answer it. I feel that global warming is one of the most significant challenges facing humanity. But I feel that it is a slow-motion catastrophe. Just as a simple example: if you go to Miami Beach or Lower Manhattan in 100 years, you are likely to find they are very different places, struggling to cope with flooding, sometimes more severe, sometimes milder. However, that is a change that will unfold over the entire coming century, giving people lots of time to adapt and adjust. Thus, those who say the danger is fabricated are underestimating it. On the other hand, those who say an existential catastrophe is imminent are exaggerating. What is true is that the carbon that goes into the atmosphere stays there for nearly a century. Thus, if we don’t act quickly, we most likely doom ourselves to a change that will unfold over decades, and which we will be impotent to prevent. As the two figures above illustrate, environmental concerns have NOT been swept away our current president. Rather, he is acting to prevent Americans from addressing problems that they feel are important, even if it involves some economic sacrifice. Gallup Inc. 2018. In Depth: Topics A to Z: Environment. Downloaded 3/27/2019 from https://news.gallup.com/poll/1615/environment.aspx. This post updates information on toxic chemical releases in Missouri and nationwide. The most recent data is through 2017. Many industrial processes require the use of toxic substances. They must be properly handled to prevent harm to people, land, and water. During the 1970s and early 1980s concerns grew about how toxic substances were being handled. For instance, tons of toxic waste were discovered dumped in the Love Canal neighborhood of Niagara Falls. Oil containing dioxin was sprayed on the streets of Times Beach, Missouri, turning it into a ghost town; people can’t live there to this day. In 1984, a malfunction at a chemical plant in Bhopal, India released a cloud of poisonous gas that killed more than 3,000 people overnight, and 15,000 – 20,000 eventually (5-7 times as many as were killed in the 9/11 attacks). Shortly thereafter, a serious release of toxic gas occurred in Institute, West Virginia. Cement Creek, Colorado, location of a toxic release in August 2015. Photo by John May. These concerns are hardly a thing of the past, however. The same plant in Institute West Virginia exploded in 2008, killing 2 and injuring 8. 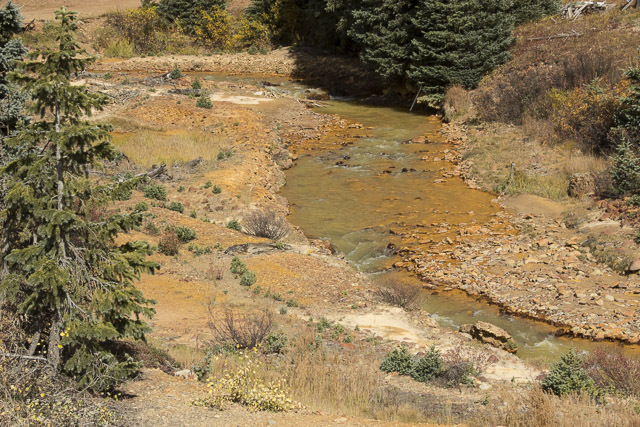 In 2015, an accident at the Gold King Mine in Colorado released 3 million of gallons of water contaminated with toxics like cadmium, lead, and arsenic into Cement Creek (see Figure 1). Cement Creek flows into the Animas River, the only water source for several cities in Colorado and New Mexico. Congress passed the Emergency Planning and Community Right-to-Know Act in 1986, and the Pollution Prevention Act in 1990. These laws require facilities to report releases, transfers, and waste management activities of toxic materials. The Toxics Release Inventory (TRI) program of the EPA gathers this information and makes it available to the public on their website. In addition, they publish an annual report covering the whole country, plus fact sheets for each of the 50 states. The TRI data does not cover all toxic materials and all facilities, but it does cover an important set of them. After being used, toxic substances can be managed or released into the environment. In decreasing order of preference, managing them can mean improving industrial processes to use less toxic material to start with, recycling them, burning them to generate electricity, or treating them to make them less toxic. Where toxic materials are not managed, they can be injected into wells, stored, landfilled, emitted into the air, discharged into surface water, or spread over the land. They can be handled either on-site or off-site. Determining whether any of these activities represent a potential hazard to people, land, or water is complex. One cannot simply assume, for instance, that on-site means safe. On the other hand, one cannot assume that emission or discharge of the substance means that there is toxic exposure. The statistics in the TRI are only a starting point, and many factors must be taken into consideration when analyzing TRI data. Figure 2. Source: Environmental Protection Agency, 2018. 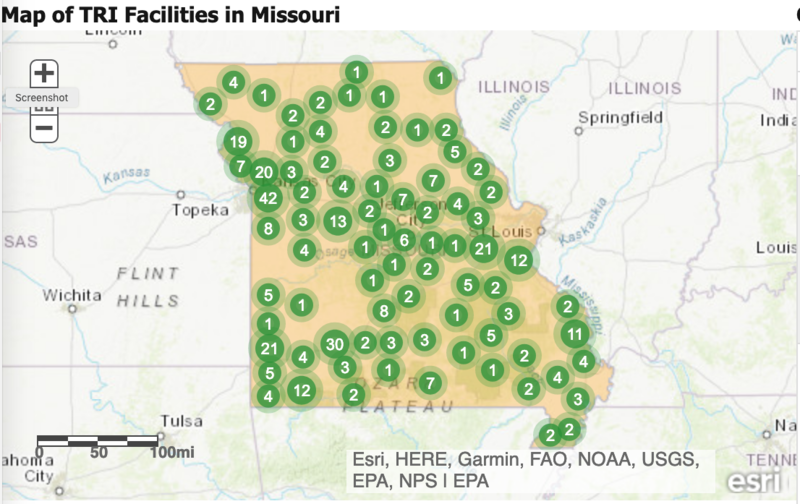 In 2017, 502 facilities in Missouri were covered by the Toxic Release Inventory. That’s down from 521 in 2013. Nationwide, 21,456 facilities were covered by the Toxic Release Inventory. That’s down from 21,707 in 2013. 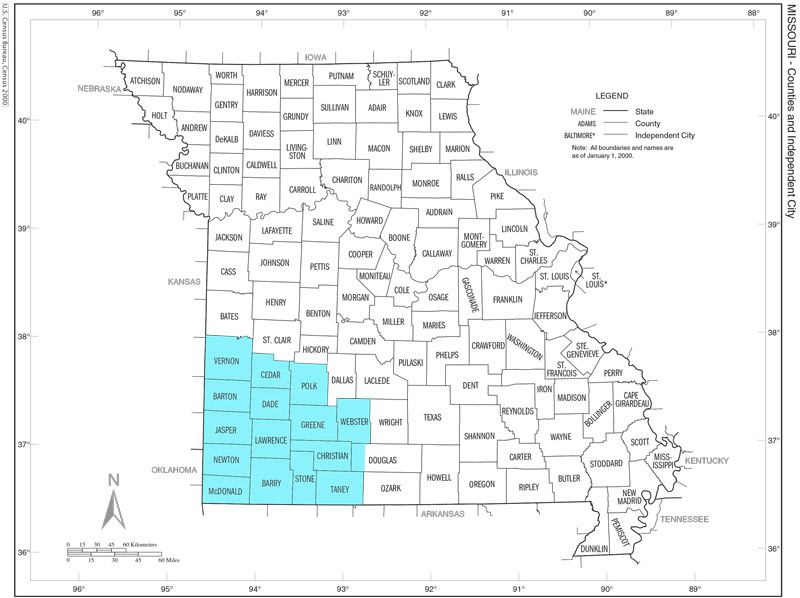 Figure 2 maps the number of sites within each county in Missouri. On the map at the TRI website, clicking on the green circle will allow you to access more detailed information for that county. Unfortunately, the TRI website does not seem to have this map available for download in a form that labels the counties. The counties with the most sites are Jackson County (42, down from 45 in 2013), Green County (30, up from 27 in 2013), and Franklin and Jasper Counties (each with 21). Having the most TRI sites does not necessarily mean the most toxic releases. One reason is that by far the most toxic waste is managed. The Figures 3 and 4 show the data for Missouri and for the United States. 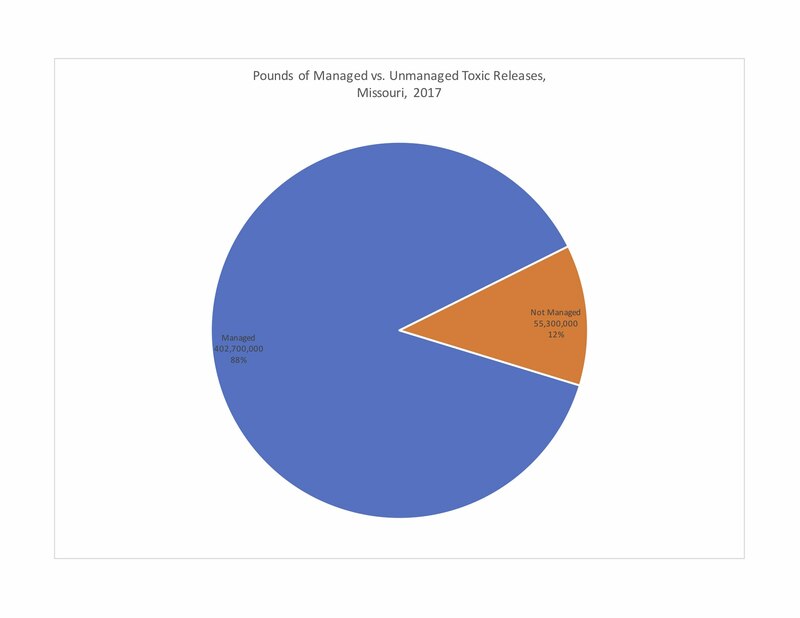 About 88% of Missouri toxics were managed in 2017, only 12% were released. 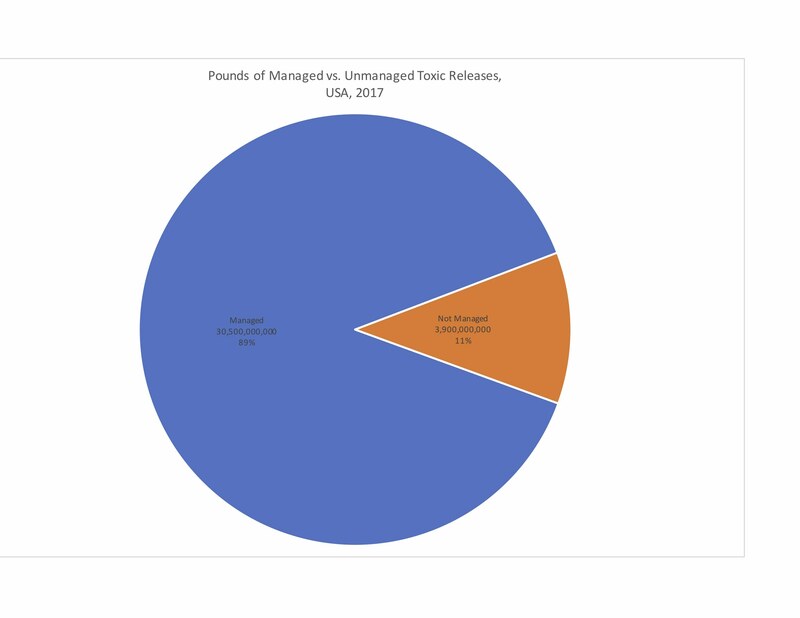 For the United States as a whole, a slightly higher percentage is managed (89%), but really, the percentages are similar. Even though only 12% of toxic materials are released in Missouri, that still amounts to 53 million lb. Figure 3. Data Source: Environmental Protection Agency, 2017. Figure 4. Data Source: Environmental Protection Agency, 2017. In the following posts I’ll look into the releases in more detail. Environmental Protection Agency. 2018. 2017 TRI Factsheet: State – Missouri. Downloaded 3/7/2019 from https://iaspub.epa.gov/triexplorer/tri_factsheet.factsheet_forstate?&pstate=MO&pyear=2017&pParent=TRI&pDataSet=TRIQ1pZip=&pCity=&pCounty=&pState=MO&pYear=2013&pDataSet=TRIQ2&pParent=NAT&pPrint=1. The IPCC report Global Warming of 1.5°C, and the Fourth National Climate Assessment were not the only climate related reports to be published in the second half of 2018. The American Meteorological Society also published its annual report on the climate, State of the Climate in 2017. Rather than a document assessing the effects of climate change, this documents presents a comprehensive picture of what the climate was like in 2017. Figure 1. Source: Blunden, Arndt, and Hartfield, 2018. 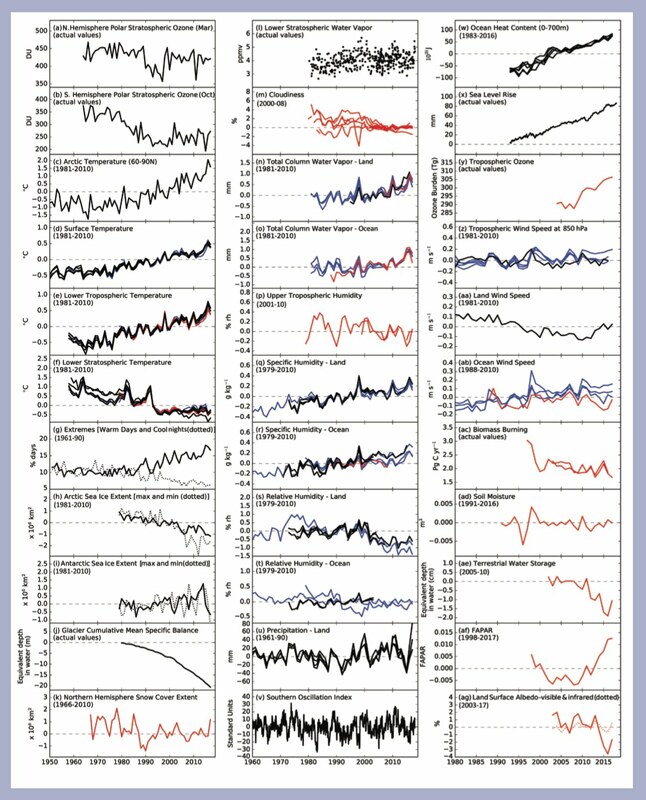 Figure 1 shows in a single graphic the major climate variables that are discussed in the report. I will discuss each very briefly in order, going down each column before moving to the next column. I’ve made the chart to open in a separate browser tab, and you should be able to refer back and forth between my comments and the charts. In the charts, some of the data is shown as anomalies rather than as raw values, and in those cases, the reference period is given in the chart. Charts (a) and (b) show the level of polar ozone, the 1st in March, the 2nd in October. This ozone is high-altitude ozone, and it is essential for blocking ultraviolet rays, too much of which are harmful. These charts concern the famous ozone hole of the 1980s. In general, the level in March bottomed in the 1980s, partially rebounded, but has again been trending downward. In October, the level bottomed in the 1980s and has been largely moving sideways since then. Chart (c) shows the average surface temperature in the arctic. It has obviously been warming, some 3°C since the 1950s. Chart (d) shows the average surface temperature of the whole earth. It has been warming, but not as much as the arctic. The recent several years show a steep spike upward. Chart (e) shows temperature in the lower troposphere. This is the lowest layer of the earth’s atmosphere, and it is where almost all life occurs, as well as almost all weather. It has been warming, and you can see the same spike in recent years. Chart (f) shows the temperature in the lower stratosphere. This is the next higher layer of the atmosphere. Near the equator it begins some 66,000 feet up, while at the poles it is lower, some 23,000 feet up. The temperature here has been cooling. I have seen some arguments that the cooling in the stratosphere compensates for the heat in the troposphere. This is like saying that cool weather in San Francisco means people can’t be dying from a heat wave in Chicago. Sorry, but it doesn’t mean any such thing. Chart (g) plots the number of warm days (solid line) and cool nights (dotted line). Warm days have been increasing, and cool nights have been decreasing. Chart (h) shows the area covered by arctic sea ice. The maximum is the solid line, the minimum the dotted line. Both have been decreasing, the minimum more severely. Chart (i) shows antarctic sea ice. The variability between years has grown significantly, and the general trend appears to be increasing. Chart (j) shows a measure of the amount of water locked-up as ice in all of the world’s glaciers. It has been declining at a significant rate. It will have implications for anyone and anything dependent on glaciers and/or glacial melt for water. Chart (l) shows the amount of water vapor in the lower stratosphere. It is quite variable, but the trend appears to be toward slightly higher amounts of water vapor. Chart (m) shows the level of cloudiness across the planet. There are several data sets. The trend appears to be towards convergence, with a slightly downward slope for at least some of the data sets. Chart (n) shows the amount of water vapor in the entire atmosphere, top to bottom, over land. It has been increasing. Chart (o) shows the amount of water vapor in the entire atmosphere, top to bottom, over the ocean. It, too, has been increasing. Chart (p) shows the specific humidity in the upper troposphere. It appears to be declining slightly. Chart (q) shows the specific humidity over land. It has been increasing. Specific humidity is not the humidity statistic we are used to, that is relative humidity (see below). The specific humidity is a measure of the mass of water vapor in an air sample compared to the mass of the other air in the sample. Chart (r) shows the specific humidity over the ocean. It, too has been increasing. Chart (s) shows relative humidity over the land. It has been decreasing. Relative humidity is a measure of the amount of water a sample of air is holding, compared to the maximum it could hold. Air’s ability to hold water increases with temperature, so it is possible for relative humidity to decrease, even while specific humidity increases, if the temperature rises. Chart (t) Shows relative humidity over the ocean. It has been mostly moving sideways, but perhaps decreasing slightly. Chart (u) shows the amount of precipitation over land. It moved mostly sideways until the 1980s, at which point it appears to have increased. The recent years have seen a significant spike upward. Chart (v) shows the Southern Oscillation Index. This is a measure comparing air pressure in the western and eastern South Pacific. It tracks the El Niño phenomenon, with negative values indicating an El Niño, and positive values indicating a La Niña. I see no obvious trend in the data. Chart shows the amount of heat the ocean is holding. The amount of heat is not the same as the temperature: a 100° pot of water holds much more heat than a 100° pot of air, though both are the same size. The heat content of the oceans has bee increasing. Chart (x) shows a measure of sea level. It has been rising. The scale is in millimeters, so the chart shows about a 6-inch rise. Chart (y) shows the tropospheric ozone level in the tropics. It has been increasing. This is not the same as arctic ozone levels, which are measured in the stratosphere, where they help to block ultraviolet light from striking the earth. This is ground level ozone, a harmful pollutant. It is the ozone I track when I report on the Air Quality Index. Chart (z) shows a measure of the speed of the wind in the troposphere. It has been increasing slightly. Chart (aa) shows a measure of the speed of the wind over land. It has been decreasing. Chart (ab) shows a measure of the speed of the wind over the ocean. It has been increasing. Chart (ac) shows the amount of biomass being burned each year. It has been deecreasing. Chart (ad) shows a measure of soil moisture across the earth. It has been moving sideways, a surprise to me, as I would have expected increased temperatures to dry the soil. Chart (ae) shows terrestrial water storage. Though the data series is short, it appears to be declining. This variable concerns fresh water, and reflects ice sheets, glaciers, and lakes. Its decline is a matter of concern for all people, animals, and plants that depend on stored water. Chart (af) shows global FAPAR. FAPAR is the amount of solar radiation available for absorption by plants during photosynthesis that actually gets absorbed. Though the data series is short, it was declining, but in recent years it has increased. Chart (ag) shows the albedo of the land surface. Though the data series is short, it appears to be decreasing. Albedo is the reflectivity of the earth. High albedo means most of the light is reflected. Low albedo means most of the light is absorbed, causing the surface to warm. Black paint has a low albedo, white paint has a high albedo. Blunden, J., D. S. Arndt, and G. Hartfield , Eds., 2018: State of the Climate in 2017. Bull. Amer. Meteor. Soc., 99 (8), Si–S332, doi:10.1175/2018BAMSStateoftheClimate.1. The National Climate Assessment is the official United States Government report on climate change. The most recent assessment is the 4th one. It was issued in 2 volumes, the first of which was published in November, 2017. It focuses on the science of climate change and the changes that are likely to occur. The second volume was published in October, 2018. It focuses how the changes outlined in Volume 1 are projected to impact our country, and on some perspectives on adaptation. In the remainder of this post, italics represent direct quotes from the Executive Summary of Volume 1. In parentheses, I give the page of the report where the quote can be found. Figure 1. Source: USGCRP, 2017. Global annually averaged surface air temperature has increased by about 1.8°F (1.0°C) over the last 115 years (1901–2016). This period is now the warmest in the history of modern civilization. (p.1) In Figure 1, the chart on the left presents a graph of the increase in temperature. The map on the right shows how the change in temperature is distributed across the world. Figure 2. Source: USGCRP, 2017. The last three years have been the warmest years on record for the globe. These trends are expected to continue…(p.1) Figure 2 maps the projected increase in temperature across North America at mid- and late-century under a low emission scenario and a high emission scenario. I favor the high emission scenario, because I see no sign we are slowing GHG emissions. The high emission scenario shows the average yearly temperature rising by 4-6°F in Missouri by mid-century. By the end of the century, some regions of the country will experience temperature increases of 8-10°F. Human activities, especially emissions of greenhouse gases, are the dominant cause of the observed warming since the mid-20th century. (p.1) There is no convincing alternative explanation. See the previous post for some comments on climate change denial. Figure 3. Source: USGCRP, 2017. Global average sea levels are expected to continue to rise—by at least several inches in the next 15 years and by 1–4 feet by 2100. A rise of as much as 8 feet by 2100 cannot be ruled out. (p.2) Figure 3 shows historical and projected sea level rise across 2 time scales – the upper chart goes back to 500 BCE. The lower chart goes back to 1800. The upper one especially shows that the increase in sea level is unprecedented in human history. The different colored lines in the lower chart represent projections from different future emission scenarios – high (red) to low (blue). Figure 4. Source: USGCRP, 2017. The incidence of daily tidal flooding is accelerating in more than 25 Atlantic and Gulf Coast cities. (p.2) Figure 4 shows the historical and projected incidence of minor tidal flooding in Charleston SC, and San Francisco CA. Minor flooding is also called nuisance flooding. Basically, it is flooding that occurs only at high tide, and is limited to a couple of feet. But it is defined differently at different locations. For an article explaining it all, see here: https://www.climate.gov/news-features/understanding-climate/understanding-climate-billy-sweet-and-john-marra-explain. The charts show that flooding is on the increase, though in San Francisco, the increase is small (also typical of other West Coast locations). It is much larger in Charleston (also typical of other East Coast locations). In both locations, minor flooding is expected to increase, and under the high emission scenario, which is the one we seem to be following, it will nearly become a daily event. Figure 5. Source: USGCRP, 2017. The trend in Figure 4 is strongest in the eastern part of the country, where the increase is large, no matter how you count the data. In the Southwest, however, the data is equivocal. That region may be getting heavier 1-day storms, but heavy precipitation is not lasting over 2 days as frequently as it used to. Heatwaves have become more frequent in the United States since the 1960s, while extreme cold temperatures and cold waves are less frequent. (p.2) I have written previous posts on how the increase in temperature could lead to deadly heat waves. One series of posts starts here. Another article is here. The incidence of large forest fires in the western United States has increased…and is expected to further increase…with profound changes to regional ecosystems. (p.2) I’ve written quite a number of posts about how fire is increasing in the West, and how that may contrast with Missouri. See here and here. 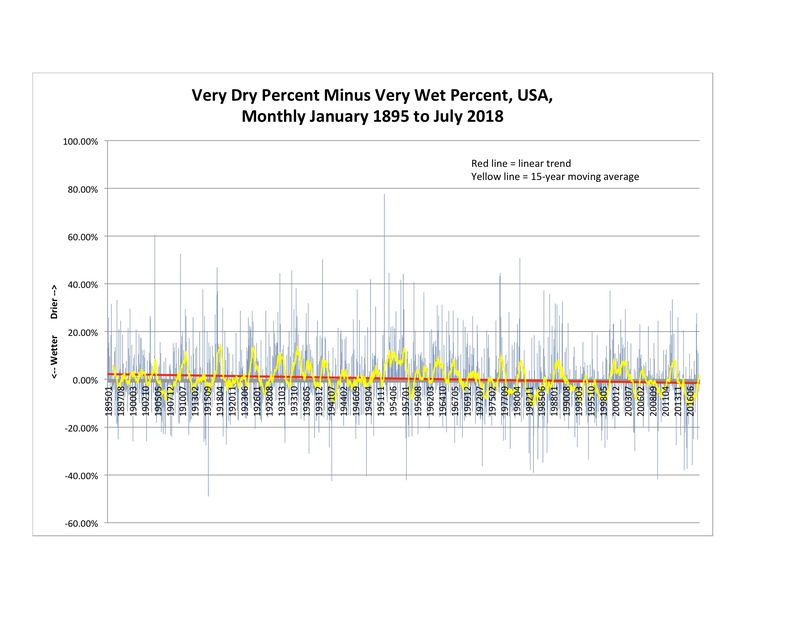 Earlier spring melt and reduced snowpack are already affecting water resources in the western United States…Long-duration hydrological drought is increasingly possible before the end of this century. (p.2) I’ve covered this extensively in my posts on the water situation in California and made a number of updates. The original series of posts is here. The most recent update is here. 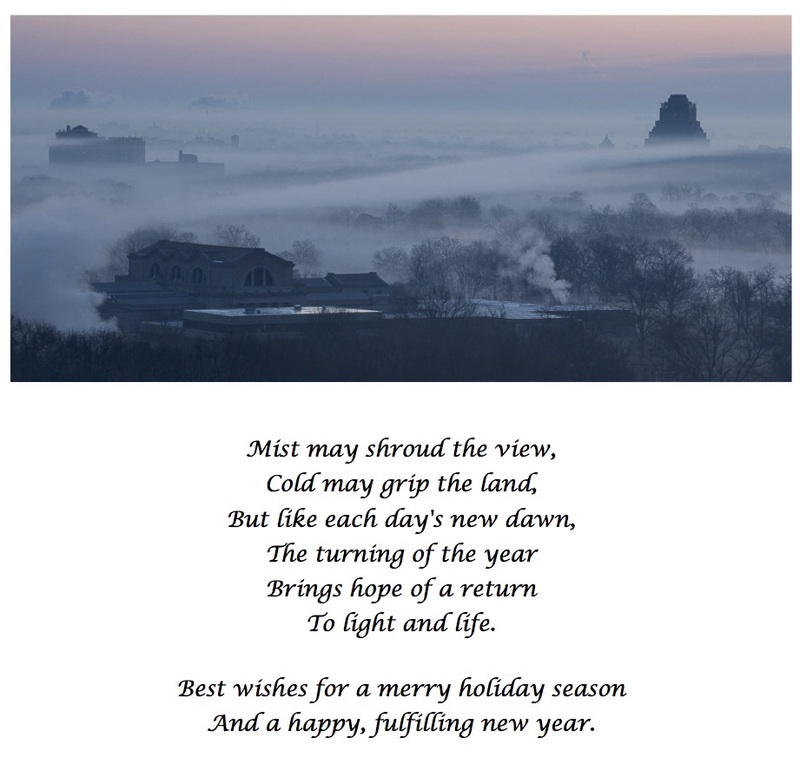 The next post will focus on Volume 2 of the National Climate Report. U.S. Global Change Research Program. 2017. Climate Science Special Report: Fourth National Climate Assessment, Volume I [Wuebbles, D.J., D.W. Fahey, K.A. Hibbard, D.J. Dokken, B.C. Stewart, and T.K. Maycock (eds.)]. U.S. Global Change Research Program, Washington, DC, USA, 470 pp, doi: 10.7930/J0J964J6. Le Quéré, Corinne, and 76 other authors. 2018. Global Carbon Budge, 2018. Earth System Science Data, 10, 2141-2194. Downloaded 12/8/2018 from https://doi.org/10.5194/essd-10-2141-2018. I ended my last post by noting that if we are to avoid devastating the planet and ourselves through climate change, drastic action is needed immediately. If you ask me, that’s been clear for a long time, but the truth has been denied by climate change deniers. Climate change deniers dislike the word “denial” because it comes from the psychological mechanism of denial, like addicts who deny that they have an addiction. Perhaps climate change deniers do have an illness like addiction, or perhaps it is something even worse. In a recent OpEd, Paul Krugman compares the denial of climate change to the denial that cigarette smoking is harmful. According to him, tobacco companies knew for decades that smoking was harmful, but undertook a cynical campaign to try to discredit the science around smoking. Why? Money. They were willing to let hundreds of thousands die in order to preserve profits. The denial of climate change, he says, has been undertaken by fossil fuel companies for precisely the same reason, using precisely the same tactics (and, in fact, using some of the same organizations to conduct the campaign). He also gives a nod to mistrust of government regulation, which will be required to address climate change (while also poking fun at it, noting that their mistrust somehow manages to allow governments to force consumers to subsidize coal. Thus, the real motivation is reduced back to money.) Krugman concludes that this is not just misguided, it is depraved. The amazing thing is that their nonsense has taken hold of an entire political party (the Republicans) and a great number of people in this state (Missouri). It reminds one of how Naziism took hold of a large number of people in Germany during the 1930s. We look back and ask how rational people could have believed such obvious nonsense, such vile evil? Could such things happen in the USA? Well, try reading The Paranoid Style in American Politics for a starter. Of course it could. The climate change deniers I have known fall into two camps. Some are simple people who are just repeating what they have heard their neighbors say, or what they have seen in the conservative media they like to follow. Others are more informed. These deniers like to see themselves as skeptics, but to me they seem pervasively suspicious, oppositional, and perhaps even querulous. They are preoccupied with unjustifiable doubts, often seeing conspiracies where none exist. They focus on details or outright fabrications to prop up their denial, while ignoring vast amounts of fact, upon which they turn their back. Because not everything is known, they argue that nothing is known. I received an email from one, a British lord no less, who comfortably turned his back on thousands of scientific references in an IPCC report, in favor of a column written by the host of an Australian children’s TV show. Well, he claimed, climate science is a vast conspiracy. Is that paranoia? Has it gone so far as to be a psychotic delusion? Were the German people who supported Naziism deluded? Psychotic? At what point does fear of the future – I’m fearful, too, it would be silly not to be – turn into suspicion and paranoia? Well, this IPCC report makes it clear that global warming, if left unchecked, is going to cost hundreds of billions of dollars yearly, and is going to ruin the lives of hundreds of millions. Clinging on to denial in the face of such facts, Krugman writes, is depraved. It is no longer a viable intellectual or political position, he argues, it is a sign of depravity. Drastic change is required immediately if we are to avoid terrible damage to our planet. Even in only economic terms, the projected damage if we do nothing is absolutely staggering. But in addition to that, the lives of hundreds of millions will be ruined. Can humankind respond with the kind of immediate, large-scale planetary change that is required, or is it already too late? Will we act, or have we sold ourselves out to the forces of depravity? Hofstadter, Richard. 1996. The Paranoid Style in American Politics, and Other Essays. Cambridge, MA: Harvard University Press. Originally published in 1952. Krugman, Paul. “The Depravity of Climate-Change Denial.” The New York Times, November 26, 2018. Viewed online 12/1/2018 at https://www.nytimes.com/2018/11/26/opinion/climate-change-denial-republican.html. I’ve reported on drought in the American West many times in this blog. What about the country as a whole? One way of looking at this question is by asking each month how much of the country has been very dry, and how much as been very wet? By very dry, I mean that the amount of precipitation for that month falls in the lowest 10% for that month in the historical record. By very wet, I mean that the amount of precipitation for that month falls in the highest 10% for that month. The National Oceanic and Atmospheric Administration keeps this data. They measure the precipitation in every county in the country, and calculate what percent of the country was very dry, and what percent was very wet. They have data for every month going back to January of 1895. Figure 1. Data source: National Centers for Environmental Information. Figure 1 shows the monthly data for every month all the way back to January, 1895. Blue bars represent the percentage of the country that is very wet. Red bars represent the percentage that is very dry. (To keep the blue and red bars from obscuring each other, I multiplied the dry percentage by -1, thereby inverting it on the chart.) I dropped trend lines on both data series. As you can see, there is considerable variation from year-to-year. There is a slight trend – hardly noticeable – towards more very wet months and fewer very dry months. But it is small, and the yearly variation is much greater than the trend. Figure 2. Data source: National Centers for Environmental Information. Figure 2 shows the same data, but it beings in January, 1994.. I constructed this chart to see whether the most recent 25 years look different than the record as a whole. 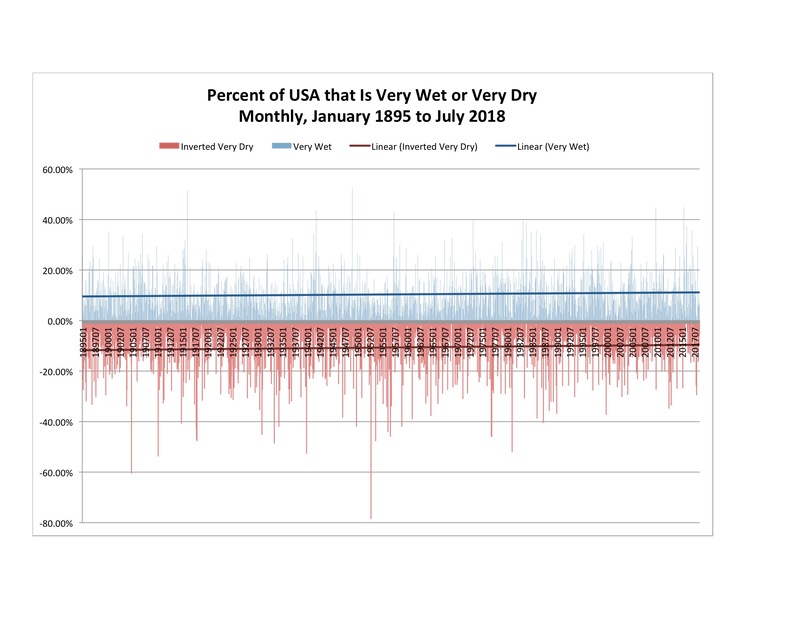 Again, blue bars represent very wet months, and the red bars represent very dry ones. I dropped linear trend lines on both data series, as before. The yearly variation is again larger than the trends. There appears to be virtually no trend in the number of very dry months. There is a small trend towards increasing number of very wet months. It appears a bit larger than did the one for the whole time period, but even so, it is tiny compared to the yearly variation. Figure 3. Data source: National Centers for Environmental Information. It’s a bit hard to read the two data series on opposite sides of the zero line, so I constructed Figure 3. For each month it shows the percentage of the country that was very dry minus the percentage that was very wet. 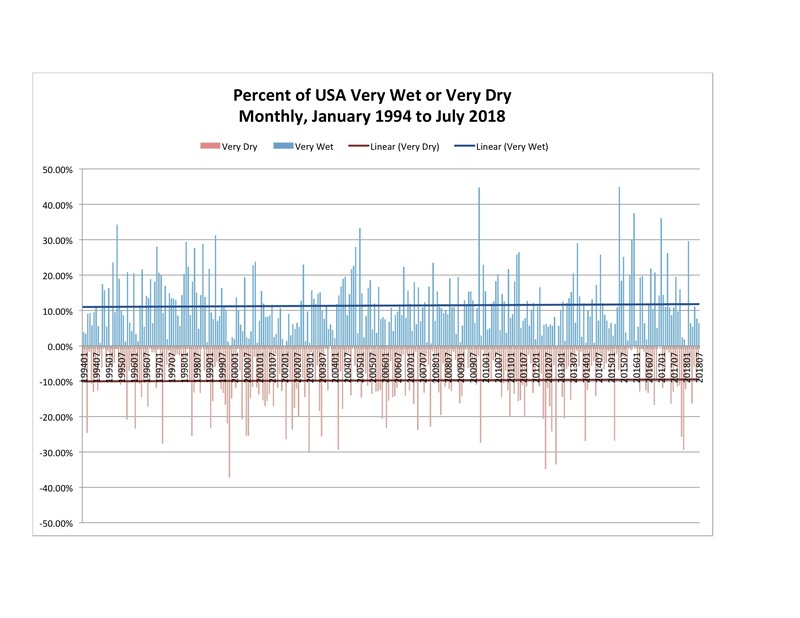 By doing my subtraction that way, numbers above zero mean that more of the country was very dry than very wet, and numbers below zero mean that more of the country was very wet. I dropped a linear trend on the data (red), and I also dropped a 15-year moving average on it. The chart shows that, as we saw in Figure 1, there is a slight trend towards fewer very dry months and more very wet ones. The variation is much larger than the trend, whether one looks at the monthly data, or the yearly. This data differs from other drought data I report. Those reports focus on the Palmer Drought Severity Index, an index intended to represent soil moisture. Soil can dry out because there is little overall precipitation, or because there are longer periods between precipitation events, or because the temperature is warmer. This data would tend to indicate that regions of the country with very little precipitation may be decreasing very slightly, very slowly. Regions with very much precipitation may be increasing. This trend would be consistent with consensus predictions regarding climate change, where overall precipitation is not expected to change, but the number of heavy precipitation events is expected to increase. National Centers for Environmental Information, National Oceanographic and Atmospheric Administration. U.S. Percentage Areas (Very Warm/Cold, Very Wet/Dry). Downloaded 9/1/2018 from https://www.ncdc.noaa.gov/temp-and-precip/uspa. It has been a dark year for America and for the world. Does Southwest Missouri Face a Future Water Shortage? 2017/06/29 8:00 am / 2 Comments on Does Southwest Missouri Face a Future Water Shortage? Southwest Missouri faces a water crisis. If nothing is done, demand will exceed current supply by 2030. However, sufficient additional water to meet demand through 2060 appears to be available, and could be accessed at a relatively low cost. Whether doing so would impact the regions ecosystem is not known. In the previous post, I reported that current stresses on water supply along the Missouri River depend primarily on human decisions about how to manage competing demands for the river’s water. The future effects of climate change are not yet known. What about regions of the state that don’t depend on the Missouri River for their water supply? Are demands projected to exceed supply? To answer that question, we must start by distinguishing between water resources and water supply. Water resources consist of the total water available in a region. Water supply is the amount of water that the infrastructure is capable of delivering. Water resources consist of surface water and groundwater. Some regions of the state depend primarily on surface water. In fact, surface water supplies 8 of Missouri’s 10 largest cities, and 62% of the state’s total water consumption (44% from the Missouri River alone). Groundwater supplies about 38% of Missouri’s water consumption. Some regions, however, rely more heavily on groundwater, especially in the southern part of the state. Figure 1. Southwest Missouri Counties Expected to Experience a Future Water Shortage. Source: Adapted from a map at Wikimedia Commons. No region of the state is currently experiencing a sustained shortfall in water supply compared to demand. Perhaps the region most likely to experience one in the future is a 16 county area in Southwest Missouri. Figure 1 shows a map of the 16 counties. The region has historically depended primarily on groundwater, as it is underlain by the Ozark Aquifer. Aquifer levels fluctuate depending on how much precipitation occurs to recharge them. In addition, over-pumping can deplete the water supply in a local region of the aquifer faster that water can flow in to replace it, causing a cone of depression. It can leave neighboring wells high and dry, but does not affect the whole aquifer. Severe over-pumping from multiple sources can deplete the entire aquifer, which is occurring in California. Figure 2. Missouri Population Density. Source: Tri-State Water Coalition. The region’s constraints on water supply have occurred because of growth. 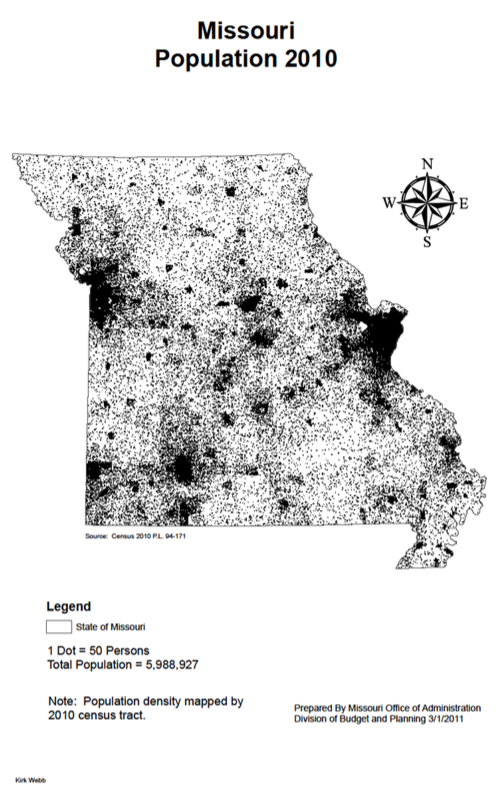 Figure 2 is a map of population density in Missouri. 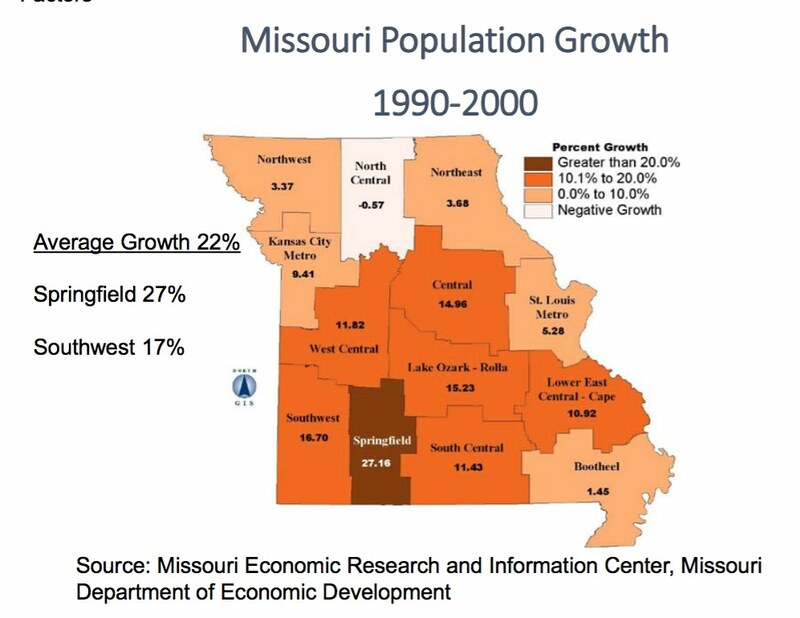 It shows that Southwest Missouri is one of the more densely populated regions. Figure 3. Source: Tri-State Water Resource Coalition. Figure 3 shows that from 1990-2000 the region was the fastest growing in the state. Between 2000 and 2010, the trend continued, with Christian County growing an astounding 43% and Taney County growing by 30%. The result has been over-pumping, and Figure 4 shows the results. 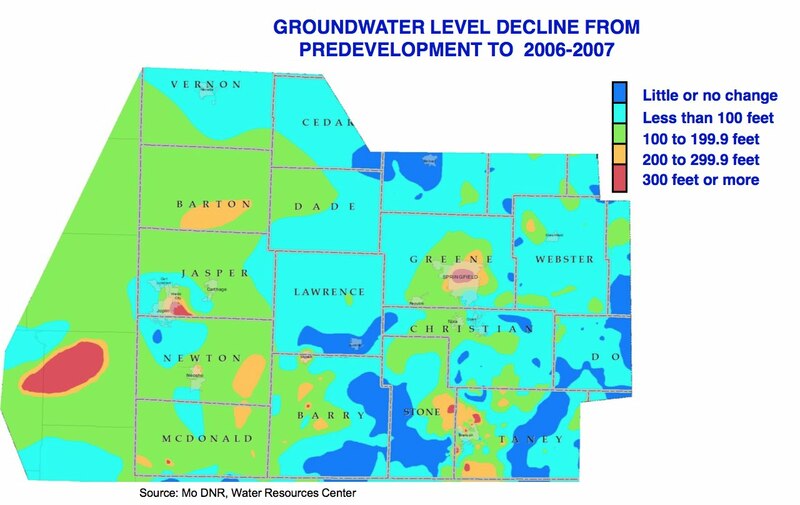 In Southwest Missouri, most areas have experienced some decrease in the groundwater level. A few regions in Green County (the City of Springfield), Jasper County (the City of Joplin), and Stone and Taney Counties (the Branson area) have experienced cones of depression, dropping the water table more than 300 feet. The worst affected area is the large red area on the left side of the map. It is in Oklahoma, centered on Miami, OK. Using a mid-level growth forecast, studies have calculated that current water resources will be overrun by demand by 2030. Even reducing demand through conservation would only meet needs through 2040. Figure 5. Projected Water Demand and Supply by 2060 in a Drought Year. Source: Tri-State Water Resource Coalition. The region has significant surface water resources, however, and could supplement its water supply. Three significant reservoirs could supply water to the region: Stockton Lake, Table Rock Lake, and Lake Taneycomo. The first two are operated by the U.S. Army Corps of Engineers, and the latter is owned and operated by Empire District Electric Company. These organizations would have to approve the reallocation of water, but the water is there. 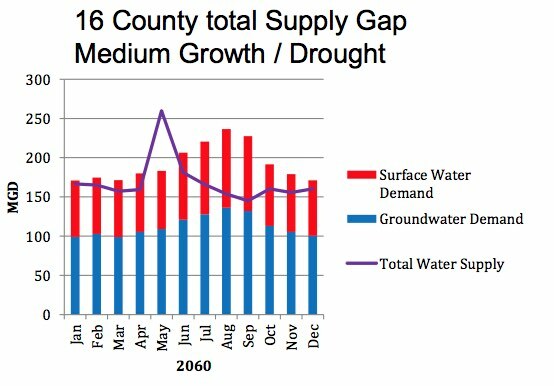 Figure 5 shows projected available supply and demand if surface water resources were tapped. It would require the construction of pipelines and pumping stations, but the dams and reservoirs already exist. Climate change is not projected to cause a decrease in precipitation in the region. The worst drought on record occurred in the 1950s, and if anything, the trend in precipitation has increased slightly since 1895. The temperature is projected to increase significantly, however. If increased temperature were to lead to less water reaching the aquifer to recharge it, then it could have implications for the regions water supply. But so far, those projections have not yet been calculated. Unfortunately, none of the reports I contacted discuss the environmental impacts that the increasing demand for water will place on the ecosystem in the region. In fact, so far as I could tell, possible effects were not even considered. Will dropping water tables cause springs, creeks, and rivers to go dry? Will reallocation of the water from the regions reservoirs affect the health of the White and Osage Rivers? Will subsidence occur? These effects have occurred elsewhere, why Missouri would expect to be immune from them? But I just don’t know. Thus, it appears that Southwest Missouri does face a water crisis. If nothing is done, demand will exceed current supply by 2030. However, sufficient additional water to meet demand through 2060 appears to be available, and could be accessed at a relatively low cost. Whether doing so would impact the regions ecosystem is not known. Missouri Department of Natural Resources. Springfield Plateau Groundwater Province. Downloaded 5/23/2017 from https://dnr.mo.gov/geology/wrc/groundwater/education/provinces/springfieldplatprovince.htm?/env/wrc/groundwater/education/provinces/springfieldplatprovince.htm. State of Missouri and U.S. Army Corps of Engineers. 2012. Southwest Missouri Water Resource Study – Phase I. Downloaded 5/23/2017 from http://www.swl.usace.army.mil/Portals/50/docs/planningandenvironmental/Phase%20I%20-%20Southwest%20Missouri%20Water%20Study%20Final%20Report%20.pdf. State of Missouri and U.S. Army Corps of Engineers. 2014. Southwest Missouri Water Resource Study – Phase II. Downloaded 5/23/2017 from http://tristatewater.org/wp-content/uploads/2014/11/Phase-II-FINAL-Southwest-Missouri-Supply-Availability-Report-Final_March_2014-from-Mike-Beezhold-9-16-14.pdf. Tri-State Water Resource Coalition. 2015. Securing Water for Southwest Missouri. Downloaded 5/30/2017 from https://waterways.org/wordpress1/wp-content/uploads/2015/05/Securing-Water-for-Southwest-Missouris-Future.pdf. Environmental factors play a surprisingly large role in the disease burden with which humankind must cope. Figure 1. Global Deaths and Disability-Adjusted Life Years Attributable to the Environment. Source: Prüss-Ustün et al, 2016. 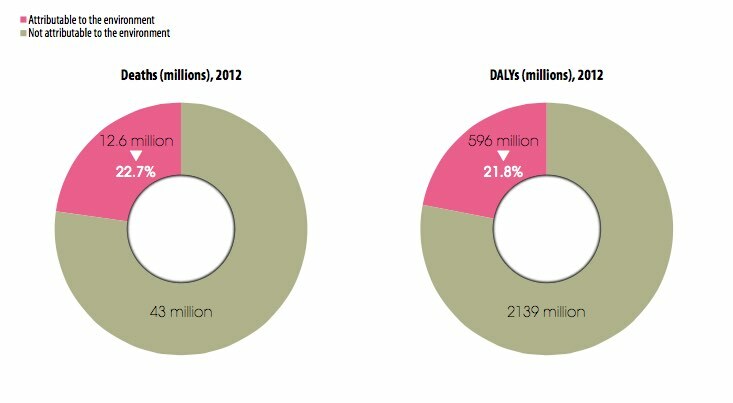 In 2012, 12.6 million deaths worldwide (22.7% of all deaths) were attributable to environmental causes, as were 596 million disability-adjusted life years (DALYs) (21.8% of all DALYs)*. (Figure 1) So says a report issued in 2016 by the World Health Organization. I reviewed some of the report’s findings in the previous post. In this post, I turn to its findings regarding specific disease conditions. Figure 2. Source: Prüss-Ustün et al, 2016. 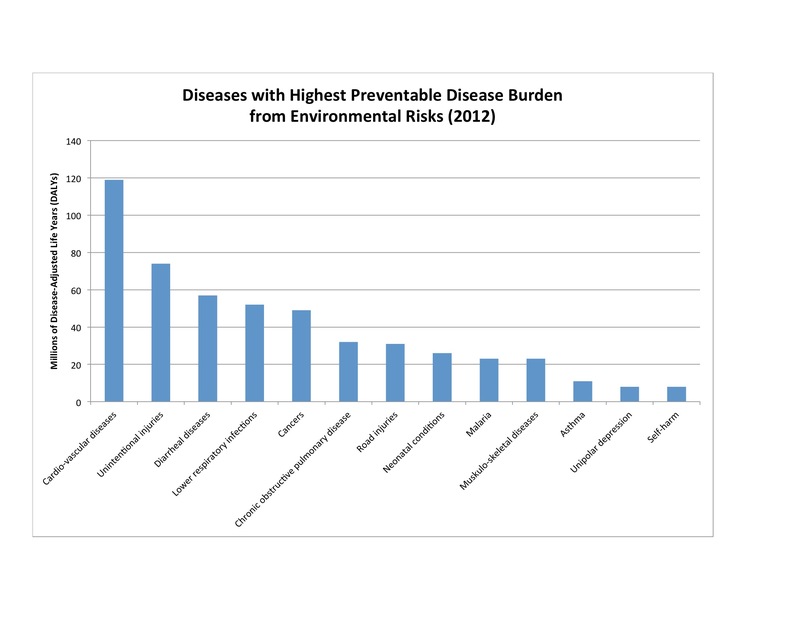 The report authors found that 13 types of diseases or disease groups had the highest preventable disease burden from environmental risks. 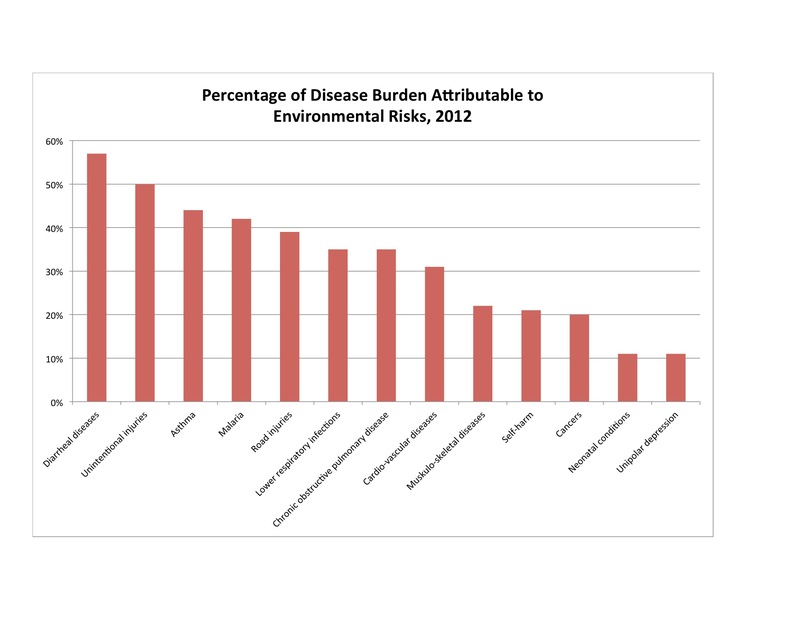 Figure 2 shows the raw number of DALYs attributable to environmental factors by disease group. Cardio-vascular diseases account for the largest disease burden worldwide, causing 119 million DALYs in 2012, some 60% more than unintentional injuries, the second largest category. Road injuries were counted separately from unintentional injuries, however. I suspect that road injuries are mostly unintentional (though road conditions and driving habits may sometimes argue otherwise). If you combine the two categories, then accidents account for 105 million DALY’s just slightly less than cardio-vascular diseases. Figure 3 shows the same data, but in a different way. For each of the disease groups, it shows the percentage of total cases that can be attributed to the environment. Thus, 57% of all diarrheal diseases can be attributed to environmental causes, the highest fraction. Fifty percent of all unintentional injuries have environmental causes (I think this means that they can be attributed to unsafe conditions that could be remedied, like working in the diamond mines of the Ivory Coast). Many of the conditions shown in Figures 1 and 2 are disease groups. Looking at specific individual conditions, the report found that fully 76% of fires and burnings could be attributed to environmental conditions, as could 73% of drownings and 57% of diarrheal diseases. The data start to sound almost like public safety or public health issues, as opposed to what we typically think of as “environmental” here in America. And perhaps, in many parts of the world, that is exactly right. Figure 4. Recommended Actions by Disease Group. Source: Prüss-Ustün et al, 2016. 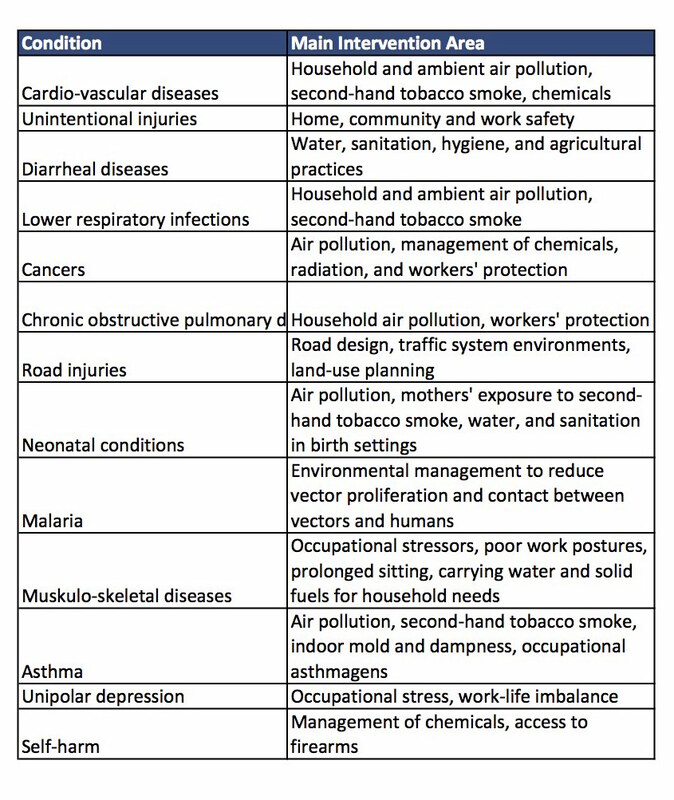 The authors make recommendations regarding which environmental interventions they thought would be most likely to significantly reduce the burden of environmentally caused disease for each of the 13 disease groups. The recommendations are shown in Figure 4. For those conditions most relevant in the United States (cardio-vascular disease and cancer) it is interesting to see that, along with second-hand smoke, household and ambient air pollution were thought to be important. I’ve discussed the progress Missouri has made in improving its ambient air quality several times, most recently here. We often ignore indoor air quality when we discuss air pollution, however. I don’t know how you would measure it across millions of buildings, but it is a very important environmental issue. If anybody knows about studies of indoor air pollution across Missouri or across the USA, please let me know. I’ll try to bring all of this home to Missouri a little bit in the next post. *Disability-Adjusted Life Year (DALY). Disability-adjusted life year is a measure used to estimate the number of years lost to early death, combined with the number of years lost to disability. To determine the number of years lost to death for an individual, subtract the age of death from the normal life expectancy. The result represents the number of years lost to death. For disabilities, subtract the age at which the disability occurred from normal life expectancy, then multiply the result by a “disability factor,” which represents the severity of the disability. The result represents the years lost to disability. Add the years lost to death and the years lost to disability, and you have the disability-adjusted life years (DALYs) for that individual. Do this calculation for every individual in the group, and sum the results across the group, and you have the DALYs for the group. Prüss-Ustün, A., J. Wolf, C. Corvalán, R. Box, and M. Neira. 2016. Preventing Disease Through Health Environments: A Global Assessment of the Burden of Disease from Environmental Risks. WHO Press: Geneva. Downloaded 5/3/2017 online from http://www.who.int/quantifying_ehimpacts/publications/preventing-disease/en.